One of the most daunting and extensive procedures that any special effects artist will face is life casting. 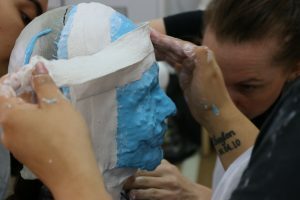 Life casting is a core skill that any special effects or prosthetics artist should know, and put simply, it is a plaster or stone replication of an actors’ face. This allows us to sculpt on top of these plaster copies and create extremely in-depth and complicated prosthetic sculptures that would not be possible using out of kit methods. At our one day, practical workshop; we will ensure that you understand what what life casts are, why they are needed and why they are an essential process for any production that requires prosthetics. Please note: We will be life casting each other so that each participant leaves with their own face cast. If you suffer from claustrophobia or any other condition that may impede the face casting process, please organise a model to work on. However, it is advised that you have an experience in make-up (whether this be self-taught, cosplay etc. ).